Next to Gerona, Reus is the second smallest airport which is also mostly used by small cheap carriers. Reus airport is situated about 85 km south west of Barcelona (about 100 kilometers via the road). Her you find more information about Reus airport. There are two transfer options via public transport from Reus to Barcelona and vice versa. Bus: From Reus airport to Barcelona the bus company Hispano Igualadina is in operation. Their timetable is coordinated in line with Ryanair flights. Here you have online access to the timetable of Hispano Igualadina. 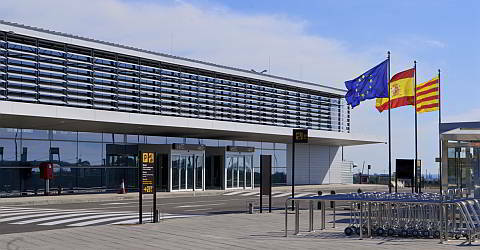 Bus transfer takes about 1 h 20 m. Departure is in front of the terminal. The bus stops (and departs from the opposite direction) at Place de la Reina station, Maria Cristina Underground Station L3, and at the bus stations of the main train station Sants (Underground station Sants L3 L5). We recommend Sants station if your hotel is not located near Maria Cristina Station. Train: The RENFE train departs from Sants to Reus station. From there, you can go the the airport via taxi or bus. Journey time is about 10 minutes. There is a shuttle service from the Reus bus and train station to the airport. The service is coordinated in line with scheduled flights. One journey costs €2/person. Here you can directly access the online timetable of the RENFE. Taxi: A taxi from Reus airport to Reus costs approximately € 18, € 28-32 to Tarragona, Barcelona about 120 €. However, you can also hire a car in order to travel. Also, at Reus airport there is the car hire company Avis operating a hand-over point. If you have quite a lot of luggage and in a larger group this could be an alternative to the shuttle bus, which is not necessarily more expensive.